“ALLAN SUTTON is the recipient of the 2013 Lifetime Achievement Award from the Association for Recorded Sound Collections. He wrote and edited for several publishers, including Greenwood Press, ABC-Clio, and Fulcrum Books, before founding Mainspring Press in 1999. He has authored or co-authored numerous works on early recordings and the sound-recording industry, including RECORDING THE 'TWENTIES and A PHONOGRAPH IN EVERY HOME. In addition to his work on sound recordings, his photographs and articles covering American historical sites and wilderness areas have appeared in Backpacker, Historic Traveler, America's Civil War, Pennsylvania Magazine, National Wildlife Federation books, and other publications. 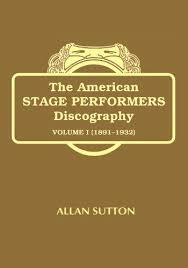 Volume I (1891–1932) draws on original recording files, trade-press and newspaper articles, and other primary-source documents to provide the most comprehensive bio-discography of early stage stars to date. Features include: Listings of all known 78s and cylinders (including private issues, tests, and unissued masters); radio transcriptions; and synchronized soundtrack discs. Full discographic information, including recording dates and locations, matrix and take numbers, catalog numbers, accompanists, and pseudonyms. Detailed capsule biographies of all performers, listing show credits with theaters and opening dates; film and radio credits; career histories, and other significant facts. Title and show / film indices. A comprehensive bio-discography covering more than 460 stage stars, from the legitimate theater to vaudeville and burlesque."